More events coming later this summer. Check back soon! A painting event for expectant CLE moms! Friends and partners welcome. Pregnant and looking for a fun yet relaxing evening out in Cleveland? 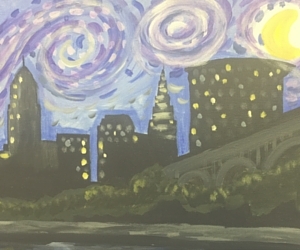 CLEbaby and Wine & Design have partnered to bring you "Mocktails & Masterpieces" - an artist-led painting event where you can relax, sip away on mocktails, and paint your very own CLE masterpiece. A skilled artist will guide you in this two hour class step by step - NO artistic ability is needed! For more information and to register, visit Mocktails & Masterpieces - Wine & Design.